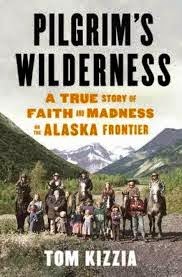 Pilgrim's Wilderness by Tom Kizzia was an interesting book with the subtitle "A True Story of Faith and Madness on the Alaska Frontier." Kizzia lives in Homer, Alaska and through Pilgrim's Wilderness he chronicles the story of Bobby Hale and his family that settled in the remote town of McCarthy. Hale named himself Papa Pilgrim and portrayed to others his role in the family as being all about homespun Christian values, but really he was just an evil loon who used religion as an excuse to control, brutalize and molest his family and take advantage of the charity of those outside his wife and fifteen children. Pilgrim's Wilderness was an interesting book that at first glance could just be dismissed as a horrific story about a madman, but there's also a ton of interesting backstory and subplot to it, both about Hale himself and the people in Alaska who seemed to latch on to him for their own purposes. Kizzia details in the book how Hale taking his family to Alaska was just another step away from troubles he created, more recently in New Mexico, where they lived on property of Jack Nicholson's, and then back to his time in Texas. Hale grew up the son of an FBI agent and friend of J. Edgar Hoover and later ran off with and married Kathleen Connelly, the daughter of John Connelly, a three-term governor of Texas best known for being shot by Lee Harvey Oswald in the front seat of the JFK limo. Before Kathleen could give birth to Hale's child, she died under suspicious circumstances, officially ruled a suicide, with Hale the only other person in the room. In terms of people in Alaska wanting to use the Pilgrim Family narrative for their own purposes, the tiny (just a few dozen full-time residents) town of McCarthy is in the Wrangell-St. Elias National Park and Preserve and after Hale bought land within the Park, he then portrayed the National Park Service and anyone representing it as being out to get his family, which was a great narrative to use for those who feel the government and Park Service overreach and meddle in the affairs of private citizens. Really an interesting book overall that's about a horrific individual who terrorized his family, but also contains a lot more and additional details can be found in an interesting New York Times interview with Kizzia after publication of the book last July.